Do more with your telehandler with a new work platform from Titan Attachments! Our work platforms are designed to lift personnel in the air with a telehandler to safely complete those hard to reach jobs. 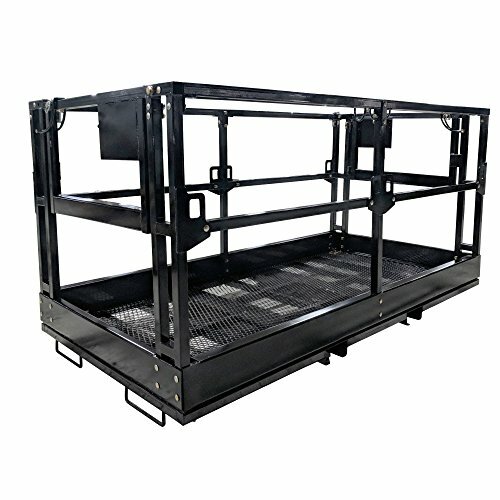 Our baskets are designed with heavy duty mesh screen flooring, an internal handrail with 2 safety lanyard rings, 8 lanyard tie down mounts around the cage, full length pallet fork pockets, 2 inward opening doors with safety latches and pins. Made from steel with a heavy powder coated finish to prevent rust and ensure durability for years of use! - Heavy duty mesh safety screen flooring. - Internal handrail with 2 safety lanyard rings. - 8 lanyard tie down mounts around cage. - Inward facing doors with safety latches and pins. - Fork pockets with safety pin locks. Heavy duty mesh safety screen flooring. Internal handrail with 2 safety lanyard rings. 8 lanyard tie down mounts around cage. Inward facing doors with safety latches and pins. Fork pockets with safety pin locks.